2. Power: single phase 220V/110V.Format of the designs: DSB, DST, FDR. 5. Dimension: 762 x 782 x 871MM. 6. Memory stock: 10,000,000 stitches. 7. 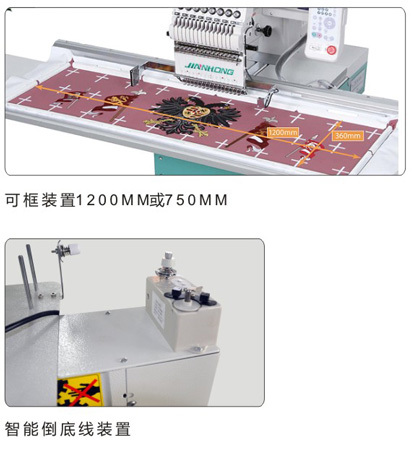 Compact embroidery machine with table, small and exquisite, easy for transit. 8. Big emb.area, flat emb.area can reach up to 350450mm. 9. High speed, the max speed can reach up to 1000rpm. High precision in driving, imported liner guide used in the frame drive guide. 10. Light in weight. The whole machine only has 120kgs. Tubes preventing thread, let the embroider out of the interference, and work smooth.